The emerald cut diamond is one of the oldest diamond shapes. Here’s all you need to know about the emerald shaped diamond. The emerald cut diamond offers a clean and sleek aesthetic - whether you have emerald cut diamond earrings, engagement ring or a pendant one thing is for sure, the flat surface of this brilliant diamond will provide amazing sparkle and shine. But where did this beautiful diamond shape come from? And why is does this cut have the same name as the brilliant green emerald jewel? In this blog, we'll tell you everything you need to know about emerald cut diamonds. How many facets do emerald-cut diamonds have? An emerald cut has roughly 25 pavilion, 25 crown and 8 girdle, making up 57-58 facets. Due to the size, angle, and shape of the facets, the emerald cut shows less dispersion and than some other cut diamonds, but still looks incredible. However, the flat surface of the top of the emerald provides a truly stunning shine and sparkle. Find out more about GIA certified Diamonds here. Where did the emerald cut diamond come from? The emerald cut diamond origins date back to the 1500s - stonecutters used this shape in emerald stones, which is where the cut and style gets its name from. Emeralds with this shape grew in popularity because the pressure was reduced during the cutting process, which decreased the risk of any chips being made in the gems, and diamond cutters took notice of this, which is when the emerald-cut diamond was born. However, the emerald shaped diamond became incredibly prominent in the 1920s art deco, with focus on clean lines and symmetry. Ever since the roaring twenties, emerald cuts have remained one of the most popular engagement ring styles. 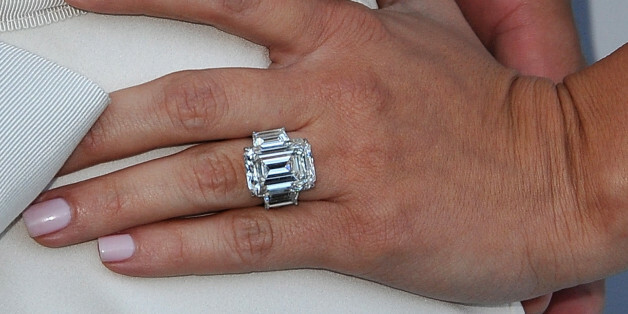 Emerald cut engagement rings have proven to be very popular within Hollywoods. Here are some amazing celebrity engagement rings . When Jay Z proposed to Queen B with an 18-carat emerald diamond in a double band to emphasise just how flawless the rock was, we were emerald-green with envy. This sparkling solitaire emerald cut engagement ring is rumoured to be worth $5 million - but Beyonce deserves nothing less! Check out our much cheaper version of this ring here. Muse frontman Matt Bellamy proposed to actress Kate Hudson with a stunning emerald cut trilogy diamond ring. The nine carat centre emerald diamond with tapered diamonds on the side is rumoured to be worth $200,000. Find a similar one here for a fraction of the price. Whilst Kris Humphries and Kim Kardashian's engagement lasted longer than their 72 day marriage, the emerald engagement ring that was gifted is truly one of a kind. The overall weight of the ring is 20.5 carats, with a central 16.5 carat emerald cut diamond with two diamonds either side. Find a similar one here. Mike Todd proposed to Elizabeth Taylor with a 29.4 carat emerald cut diamond Cartier engagement ring. Unfortunately the marriage was short lived due to Todd's untimely death due to a plane crash the following year - this stunning engagement ring is arguably one of the most dazzling diamond rings ever. Check out a similar version here. Solitaire diamond studs are the perfect addition to any wardrobe. Adding sparkle and shine, these emerald cut diamond earrings will enhance your outfit and add a splash of elegance. Available in yellow, white and rose gold, platinum and palladium, you can design the perfect pair of earrings to suit you. Sleek and sophisticated, this unique emerald-cut diamond pendant with round cut diamond detail will add a splash of elegance to any look. This beautiful diamond sits in a four prong setting, and is available in white, yellow or rose gold, or platinum and palladium. Everyone needs a staple diamond ring in their jewellery box, and we love this 7 stone emerald cut diamond ring in a prong setting. Choose from platinum, palladium, yellow, rose and white gold. Find out more about diamond cuts and shapes here.